Creating hot winter cocktails to serve during the cold months can be easy with a few simple additions to your drink menu. As customers bundle up and prepare for shorter days, your warm alcoholic drinks for winter can be a joyful, welcomed break to the cold, dreary season. Whether the holidays are right around the corner, or you’re looking to heat up the mid-winter monotony, try incorporating these drinks into your seasonal cocktail menu this winter. When the weather is feeling frightful, give guests a reason to get out of the house and into your bar with these warming winter cocktails. Spice up the classic hot chocolate everyone remembers from childhood by creating a comforting cocktail to snuggle up with on a cold winter night. 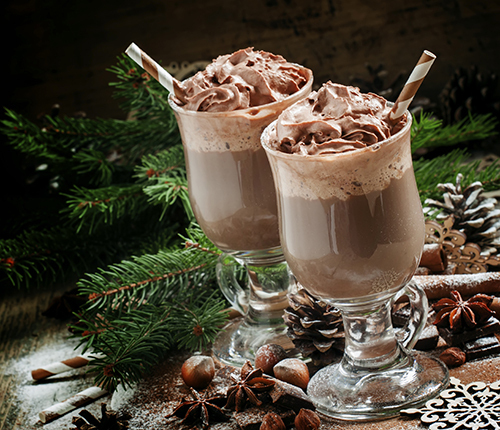 Try these hot chocolate transformations to give guests a nostalgic feel at your bar. If you’re creating hot chocolate from scratch, incorporate red wine to add rich, fruity flavors without overpowering the sweet taste of warm chocolate. Add bourbon and sea salt to your hot chocolate to create an irresistible sweet and smoky taste. Combine house-made or premade hot chocolate mix with classic flavors such as peppermint schnapps or Irish cream. As soon as fall hits, apple cider is everywhere. For a boozy twist on this classic fall and winter drink, incorporate rum or apple brandy. Buy bottled cider to use in your cocktails, or make your own cider for a homemade feel. To create an extra decadent drink, incorporate seasonal spices and flavors including, cloves, cinnamon, brown sugar, and butter. Garnish with an apple slice or cinnamon stick to add a bit of flair. If guests are getting a case of the sniffles, a hot toddy may be the perfect remedy. This classic British drink is revered for its medicinal properties, making it the perfect drink to relieve cold symptoms. A classic hot toddy includes whiskey, hot water, sugar, lemon, and cinnamon sticks. If you're feeling under the weather and looking to get over a cold, warm up with a hot toddy. While traditionally served cold, these winter cocktails get their heat from the inclusion of aromatic spices and alcohol. Though it can be an acquired taste, eggnog is a classic drink customers crave around the holidays. 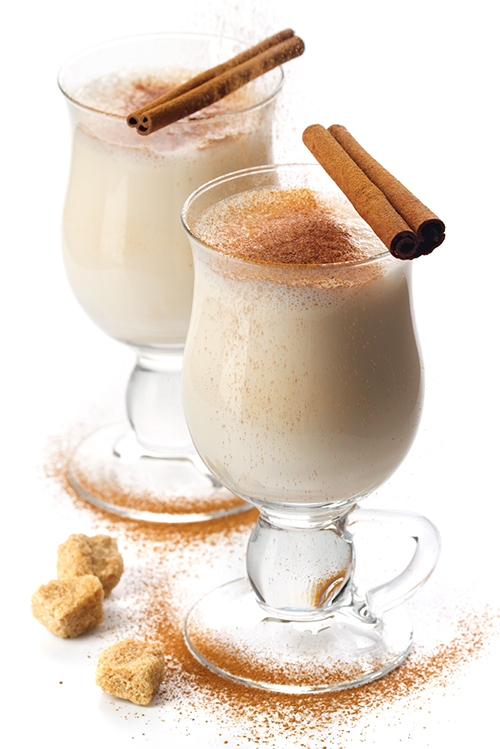 Create your own house-made eggnog with eggs or egg whites, milk, vanilla, cinnamon and cloves. To create the spiked version, you can add in rum, bourbon, or brandy. Create an aromatic display by sprinkling nutmeg across the top. Below are a few ways to spice up this traditional winter cocktail with modern ingredients and ideas. Add ginger liqueur to create gingersnap-flavored eggnog. Mix savory and sweet by incorporating a hint of maple syrup and topping your guest’s drink with crumbled bacon. Add in lemon zest for a refreshing twist. Create vegan eggnog by replacing the eggs with cashews and coconut or almond milk. Irish coffee is a versatile drink that can be served from brunch to dessert. It features a base of coffee, whisky, and sugar topped with a generous heap of cream. Once served, the coffee is meant to be sipped through the cream to create a rich, sweet flavor. To give this old classic a modern twist, there are several ways to update or add to its ingredients. Instead of hot coffee or espresso, give cold-brew coffee a try. And for an extra punch, you could also incorporate an espresso-based liqueur to emphasize the bold coffee flavor or creme de menthe for a cooling effect. While sangria is often synonymous with summertime, it can work throughout the winter as well. For large catered events and parties, it can be difficult to serve these hot, made-to-order drinks. That’s where sangria comes in. When paired with winter fruits and spices, this summer drink transforms into a cold-weather favorite that guests will love. Here are a few winter menu ideas for sangria. Cranberry Orange: Combine the flavors of cranberry juice and orange liqueur to create a tangy, sweet concoction that pairs perfectly with sparkling white wine. Top it off with fresh lemon, orange, and cinnamon sticks. Pomegranate Mint: Incorporate the refreshing flavors of pomegranate juice, fresh mint leaves, and oranges into a white wine and sparkling Moscato base. Apple Cider Cranberry: This tart and refreshing combination includes sparkling apple cider, granny smith apples, cranberry juice, and moscato. Pomegranate Cinnamon: To give your sangria an extra kick, throw some red wine in the crock pot on low and add in brandy, triple sec, pomegranate juice, cinnamon sticks, and assorted fruits. Blood Orange: Blood orange combined with cinnamon sticks, maple syrup, pomegranate juice, and apple creates the perfect blend of winter fruits and hearty spices for an irresistible flavor that is perfect for pairing with sauvignon blanc. What Winter Menu Ideas Would Pair Well with These Cocktails? Once guests have enjoyed a cocktail or two, they may be looking for some food to complement the comforting flavor notes and warming aromatics of their hot or cold beverages. From bars to fine dining, here are a few suggestions that can be used to create elegant, gourmet pairings or fast-casual dishes. Hot Chocolate: If your guests want something salty to balance out the sweetness of cocoa, offer light, salted foods that won’t get too greasy. Combine popcorn with spicy cayenne or cumin, or pair soft pretzels with zesty mustard. For a high-end feel, offer a charcuterie board filled with salty meats and savory cheeses. Hot Apple Cider: This drink offers versatile flavors that pair well with a number of classic fall dishes. Offer hot turkey sandwiches or squash soup as a subtle nod to Thanksgiving. Or, use the tartness of your guest’s beverage to cut through creamy, rich pasta sauces or sweet desserts, including cinnamon sugar doughnuts or even apple pie. Hot Toddy: Pair a warming hot toddy with buttery, flaky pastries filled with delicate fruits, jams, or jellies. Baked brie paired with fresh fruit complements the sweetness of the hot toddy’s honey without overwhelming it. Eggnog: To complement the hint of nutmeg, pair this cocktail with toasted nuts and warm, soft cheese spread across housemade bread or crackers. Irish Coffee: Since Irish coffee can be served any time of day, it pairs well with a number of winter foods. When served at dessert, Irish coffee and tiramisu create the perfect pairing. Both include decadent notes of chocolate combined with light and silky toppings. Sangria: When pairing foods with sangria, it’s important to think about what will cut through and complement your sangria’s sweetness. Offer savory meats like steak or grilled chicken paired with charred vegetables. Additionally, fatty foods such as olive oil and avocado work well to counteract the wine’s acidity. Whether you’re preparing a menu for an upcoming winter wedding, or you’re just looking for a tasty way to keep your customers warm, this list includes a diverse and inclusive set of cocktails. Stick to the classics when preparing each recipe, or try putting a unique spin on an old favorite. And if cocktails are not your thing, try some winter beers instead. With these drink ideas and food pairings, your bar or restaurant’s menu should be set until spring.